This month's Employee Spotlight belongs to Jesse Ivie! Jesse has been an awesome member of the YES team for two years now and has recently transitioned into a new role with a very large, important new client. We are excited to see him learn and grow even more so than he already has done here at YES. Jesse is such a fun jokester, as well as a hands on, hard worker and we value him more than he may ever know. Thanks Jesse for all that you do for YES! You add so much fun to our Ogden office and even our company wide activities and group chats. Thanks for being you! Hanging out with my family, hunting, downhill mountain biking, fly fishing and pretty much anything else outdoors. I absolutely hate going to Ross with my wife, she is a queen of browsing. I don’t enjoy seafood and I don’t like cleaning, but I hate things being dirty even more so that’s kind of a lose-lose situation there. I like the friendships and atmosphere at YES, what other job can you make fun of your co-workers with the owners of the company and not get fired? Forget about it. A private masseuse could make any workplace better, or a coke machine so I could fill up on dew in times of need. I have always been a huge fan of Brad Pitt, I think it would be pretty awesome to go ride Harleys or fly fishing with him and see how he really is in person. If he said no and I wasn’t married, I would probably go for Emma Watson. She's a babe. I’ve been to a few cool places in my day, but I think my favorite spot that I could got to over and over again would be the Uintas. I have been going there every year camping since I was born and just haven’t found a place that beats it yet, not even the Virgin Islands which would probably be second best. 7. You like to hunt. What’s been your most memorable hunting experience. Why? Most memorable hunting moment would be the first year was able to go deer hunting, I was six or seven and the rule was I had to be at least eight but my grandpa decided to sneak me in his trailer and bring me anyways. But that first trip with the “guys” deer hunting was what started it all. I can still remember it like it was yesterday, all the sights, smells, and even the deer that came back to life and ran off after my uncle had already shot it and we were about to clean it. Yeah, that’s a memory that’s not leaving anytime soon. Number one challenge at YES would be just making sure that everything gets done on time and mostly that I don’t forget anything. Have a solid team here at YES that I can trust and rely on to help me if and when I need it. And lots of sticky notes. 10. I tell people all the time that YES is a great place to work for or to look into working with because we are here for them. 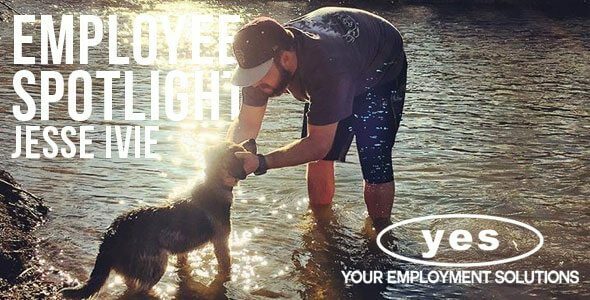 YES has always been about the employees and helping them do what they think is best, sometimes it doesn’t always work out as you planned but as long as you’re willing to put in the hard work, it will work out for the best in the long run. 11. Speaking of hunting… Reed or Kerry. Who do you bring along outdoors to protect you from mountain lions? And also from bears? Easy, Kerry for mountain lions because he would be easier to trip or have as a distraction for me to get away or to get a good shot off on the lion, and I would take Reed for bears because me and him could easily take one out together, if not we would at least put up a good fight. Thanks Jesse for all that you do to make YES the best staffing company in Utah!